With Summer here (some would say fast approaching) – there is nothing better than creating a summer salad with fresh, punchy and vibrant flavours. 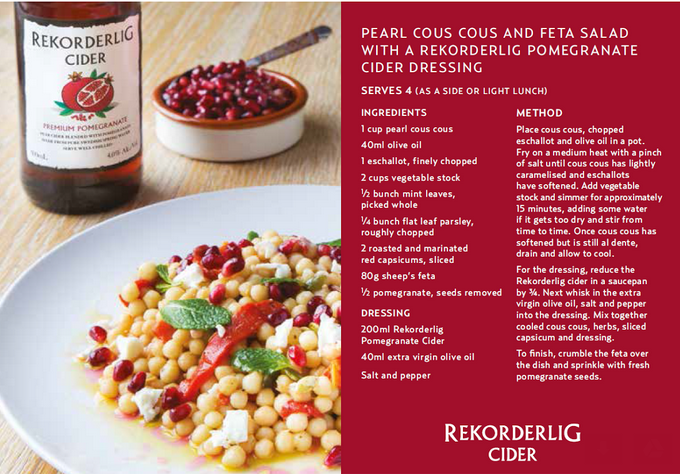 Thanks to Rekorderlig for sending through this recipe for you all to try – which incorporates their fresh new Premium Pomegranate flavour. Try it out for yourself and comment if you do and what you thought about the flavour combination. Below is a recipe created by My Kitchen Rules winners Sammy and Bella. Check out their website www.sammyandbella.com for more delicious recipes! ENJOY! Rekordelig cider was first created in 1999 with the purest spring water from Vimmerby in Sweden. They are stocked in a wide range of Australia’s favourite bars and retailers and is continuing to laucnh in new countries all around the world – maintaining its proud Swedish heritage. Rekordelig is a typically Swedish fusion of high-end, premium design and modesty, it has a clear identity that sets it apart from others. Enjoyed by those who yearn for something refreshingly different, join Rekorderlig on a journey of exploration, innovation and invigoration. 2) Fry on a medium heat with a pinch of salt until cous cous has lightly caramelised and eschallots have softened. 3) Add vegetable stock and simmer for approximately 15 minutes, adding some water if it gets too dry and stir from time to time. 4) Once cous cous has softened but is still al dente, drain and allow to cool. 5) For the dressing, reduce the Rekorderlig cider in a saucepan by 3/4 . 6) Next whisk in the extra virgin olive oil, salt and pepper into the dressing. 7) Mix together cooled cous cous, herbs, sliced capsicum and dressing. After lining up for almost 5 hrs to get into The Block, N and I needed to grab something to eat. We decided to walk around the Albert Park area – where The Block was located – and stumbled on The Petty Officer. I had previously wanted to come here, but had momentarily forgotten about it. 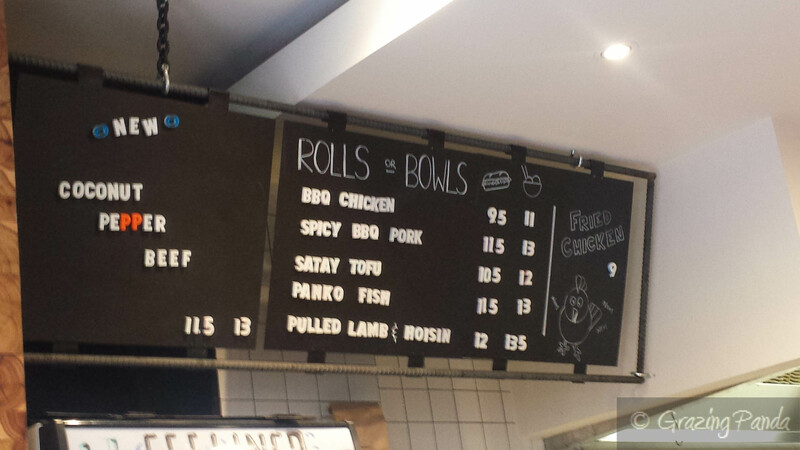 The Petty Officer is located in Bridport Street in Albert Park and is owned by Dave and Zoe Makin, Adam Mariani and Matthew Lewin – who are also behind Axil Coffee (Hawthorn). Located in what used to be a former fine dining restaurant in its former life in a restored Victorian building. The fit out is brilliant – it has huge windows allowing the natural sunlight to stream through and is very spacey and roomy – thanks to the high ceilings, as well as the layout. As you walk in you are drawn to the massive bird motif behind the coffee station – which stands out in black & white against the white backdrop of the wall. The tables are all wooden – a mix of high and low tables – and paired nicely with black chairs and stools. Another stand out are the hour glass shaped light shades that dot the ceiling throughout the space. Near the back of the venue is a communal table complete with cherry blossom art work on the walls. Chic and classy, yet relaxed. It was quite a nice Melbourne day – so we decided to sit outside. Being the owners of Axil – coffee is a strong point here at The Petty Officer. 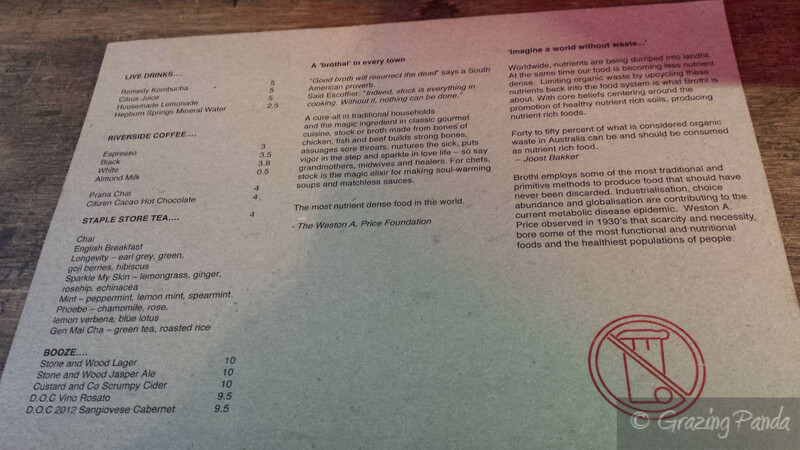 I order a latte whilst mulling over the menu. Espresso coffee is the main focus, however there are filter options as well. My latte is crisp, nutty and left a clean finish on the palate at the end. Delicious! The head chef is Dan Woollard (ex-Il Solito Posto) and there is a breakfast menu that is served all day together with a lunch menu. Everything is made in-house except the bread. There are the favourites such as Avocado Smash with Feta, Buttermilk Pancakes, Baked Eggs, Bircher Museli with a yoghurt Pannacotta as well as a Fritter dish. For lunch you will find dishes such as a Lamb Wrap, Cauliflower Salad, a Pulled Pork burger as well as some Chicken Dishes. 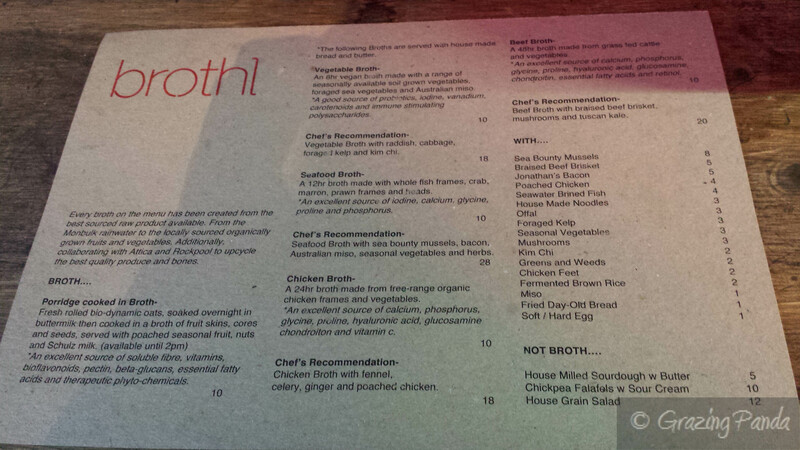 Refer to the menu above for more info. I decide to order the Beetroot, zucchini and haloumi fritter, avocado, spinach, poached egg, tomato relish in the end. I was tossing up between this dish and the Spicy Baked Eggs. The dish was different to any other fritter dish I have seen – instead of smaller individual fritters on the plate – this fritter was one large round and flat fritter – with the avocado, spinach, poached egg and tomato relish all placed cleverly on top and finished with flowers. The fritter had an interesting combination of flavours and was not dry at all. The combination of beetroot, zucchini and haloumi was very refreshing and combined with the other whole elements was great. The fritter itself is quite dense and overall the dish is very filling. The poached egg was gooey and runny just like how it is meant to be. N ordered the Local chorizo, potato croquettes, sautéed spinach, poached eggs, parsnip relish. The chorizo was in the centre of the dish, and is flanked by the potato croquettes and the poached eggs on top. N is a huge fan of chorizo and said that the quality and flavour of this chorizo was top notch. I tried some of his potato croquettes – which were crispy on the outside and soft and cloud-like on the inside – really delicious. The Petty Officer is a licensed café and offers a selection of red and white wines, along with ciders and beers. There are sweet goodies in the form of cookies, cupcakes and muffins located at the counter inside that look scrumptious as well. The Petty Officer (which takes its name from a navy rank) – is located a short stroll from the beach – is a great place to spend a weekend having a casual breakfast with dishes that bring you quality and taste. Atmosphere / Ambience: Casual, Classy, Relaxed. Great place to spend on the weekend just to chill out and enjoy some great coffee and food!